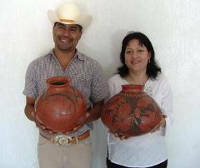 Lucy Mora de Bugarini is married to Lorenzo Bugarini and they work together in Mata Ortiz producing pottery. 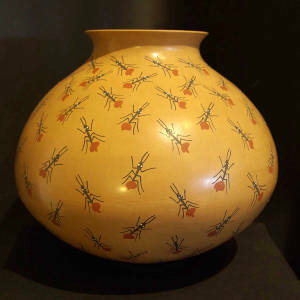 She seems to like making large ollas and decorating them with designs that feature ants and other insects. She and her husband have traveled extensively in the southwestern United States doing pottery-making demonstrations.